In Bluewater Trading LLC v. Fountaine Pajot, S.A., et al (08-16824), the Eleventh Circuit affirmed the district court's holding that it lacked personal jurisdiction over the defendant. Kaye, a resident of the Virgin Islands, contracted to buy a new "37' Fountaine Pajot Maryland catamaran power trawler from Willmar USA, Inc...The purchase contract was subsequently executed in the U.S. Virgin Islands. Before the yacht was delivered, Kaye formed Bluewater Trading LLC (“Bluewater”), a Delaware limited liability company, and transferred his interest in the purchase contract to Bluewater. In January 2006, the vessel was delivered to Bluewater in the British Virgin Islands. Within weeks of that delivery, Bluewater discovered numerous manufacturing defects in the vessel and demanded from Willmar and Fountaine a copy of the written warranty and execution of warranty repairs." The repairs were not satisfactorily and the suit was filed alleging "violation of the Magnuson-Moss Warranty Act, 15 U.S.C. §§2310(d), 2302(b)(1)(A), and 16 CFR 702.3, and violation of the Florida Deceptive and Unfair Trade Practice Act. (R.2-57.) Fountaine’s General Manager 1 was served with process while he was in Miami, Florida, attending the Miami International Boat Show...Fountaine moved to dismiss Bluewater’s claims on the grounds that the court lacked personal jurisdiction over Fountaine and that the forum was inappropriate. 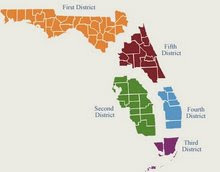 After the parties engaged in extensive discovery and submitted evidence regarding Fountaine’s contacts in the United States, the district court granted Fountaine’s motion, holding that Fountaine was not subject to personal jurisdiction in the Southern District of Florida. The Eleventh Circuit agreed there were insuficinet contacts to subject the defendant to personal jurisdiction in Florida. "Here, the evidence was that Fountaine did not directly sell vessels in Florida, did not exercise control over Willmar in its sales or warranty service, and did not have a contract with Willmar. We do not accept Bluewater’s invitation to impute Willmar’s contacts with Florida to Fountaine...We also agree with the district court that specific personal jurisdiction cannot be asserted over Fountaine under" Fla. Stat. § 48.193. "Finally, we agree that Federal Rule of Civil Procedure 4(k)(2) does not provide a basis for assertion of personal jurisdiction over Fountaine. As stated above, Fountaine’s contacts with Florida are limited. And, even when considered in conjunction with Fountaine’s other contacts with the United States (attendance at the Annapolis Boat Show ), they are insufficient for 2 the assertion of personal jurisdiction to comport with due process. Finding no personal jurisdiction, we need not address Fountaine’s forum selection clause argument."